Tradition, closeness, and a strong sense of equality. These were, I figured, the most common reasons why these young men were here. I am not talking about a community center. It is a coffee shop! While Starbucks and its friends have been ruling the world of coffee in big cities in Indonesia, local coffee shops are still near and dear to the heart of people of small towns. Comparatively, the coffee culture of Indonesian is not as vibrant as the Vietnamese’, but we are still very much coffee than tea drinkers. Kopi Tubruk remains a favorite brewing method for most people, it is simple and fast. Not to mention how affordable it is with an average price tag of less than 3,000 rupiah or about 35 cents US$ in local shops. Albeit similar in nature, it is by far a contrast to the urban youth trend in big cities. The young men at Waris are far from being a frappuccino generation. Here I was, entering an old bamboo wall house of about 400 square meters. The supposedly white color of the wall was fading to yellowish. Wooden square tables were set with no particular order. There is tile or cement on the ground. Not a particularly huge place, considering around 200 guests sitting there. It is the ”Warung Kopi Waris” or Waris Coffee Shop in Tulungagung a town of about 4 hours away by car from Surabaya, the capital of East Java Province. Waris is one of the most happening place in town. At Waris, they serves Kopi Tubruk, which literally means ‘colliding coffee’. This terms particularly refers to the most common and simplest method of brewing coffee. Pouring boiling water into a cup filled with coarsely grounded coffee and sugar. It becomes, what is known by international coffee lovers as black coffee. But again, like anywhere in the world, drinking coffee is never a straight affair of drinking the beverage. It is about a lot of rituals that comes with it. 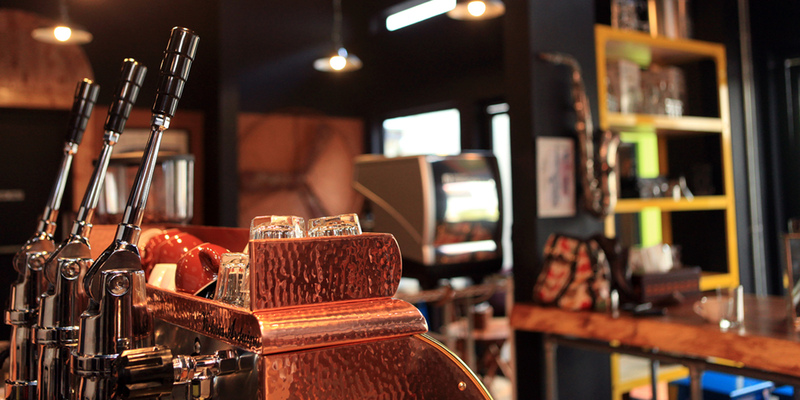 Drinking coffee at Waris is about the life of young men of about 18 – 25 years old. It is so much about how this tradition has been passed on since generations. It is also sometimes about watching and making funny or nasty comments on the gossip program on the television. More importantly, it is about ritual called Nyethe. 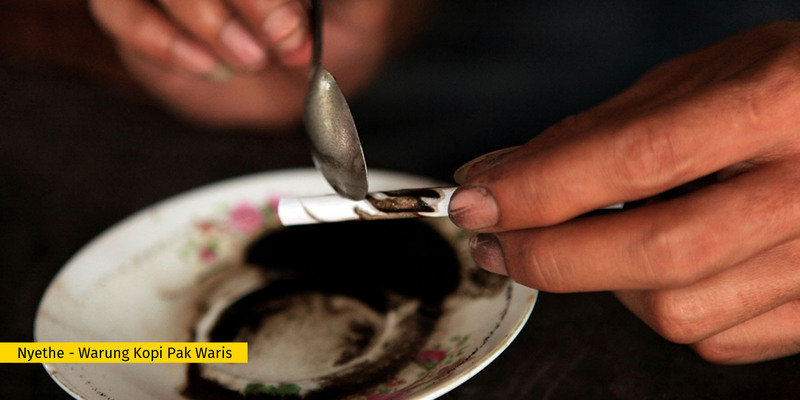 It is a local term means painting the cigarette using coffee ground excess from their cup. The coffee ground is the ink. Some men are extremely good at it that it took them a mere 10 seconds to draw an intricate batik design on their cigarette. It is quite an entertainment in itself to see some who were particularly skilled at doing Nyethe. They were simply so good and so fast. It is fascinating to observe people transforming cigarette and coffee into a piece of art in a matter of seconds. There was no customer with laptop, yet the coffee shop was equipped with wireless connection. This is what Waris is trying to do, despite no single customer with laptop while I was there in May 2010. The scene at Waris is not the a daily affairs in many other part of Indonesia, especially Yogyakarta. Cofee shops of Waris’ genre here are catered for mostly students community. Yogyakarta is a place where traditions blend well with modernity. They are typically open for 24 hours. Simple coffee shops there would most likely have wi-fi facilities, a right move for a student town like Yogyakarta. Sipping coffee and nyethe is an example of a wide range coffee culture in Indonesia, the fourth largest coffee producer in the world. Thanks to the Dutch who introduced coffee in 17 century. Indonesia was seen as a heaven for coffee plantation for its perfect climate and soil to cultivate the bean. Nowadays, Indonesian are blessed by the various variants of coffees that spread from Aceh Gayo, North Sumatra, Java in West to Toraja and Papua in the East. The rule at local Indonesian coffee shops is: no rule. One can freely lay down, or just playing chess or cards for many hours. No dress code required, you can laugh, chat or even sleep. Sometimes the owner is so overly generous and reluctant to wake up the customers should they fall asleep until sun rise. All in all, coffee shops are growing rapidly as many people especially middle class are now trying to appreciate this beverage and enjoy drinking specialty coffee than gourmet coffee. For those who can afford a high-end espresso machines, many retailers selling this equipment as coffee aficionados will be able to groom their passion as home barista. Behind this story, kopi tubruk will reminds an Indonesian coffee icon, a simplest brewing method as the coffee itself. After all, it is not only about drinking coffee. It is about feeling comfortable. Brew well and drink well, kopi Tubruk—a 300 years of tradition.